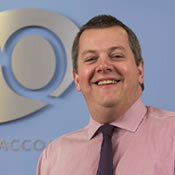 Ross joined EQ as a partner in May 2016 from another firm of accountants. A member of the Association of Chartered Certified Accountants (ACCA) and Chartered Institute of Tax (CTA), he is a specialist in advising directors, shareholders, business owners and their families on their accounting and tax issues, across a wide range of industry sectors. Ross enjoys getting to know his clients, and working with them to help them achieve their commercial and life goals in a tax efficient manner. His accounting and tax expertise covers a wide number of areas, including, business restructuring, tax efficient remuneration, acquisitions and disposals, employee share incentives, business valuation and entrepreneurial tax advice. Outside of work, Ross is a keen golfer and enjoys spending time with his young family. In addition, he is Treasurer of Dunfermline Round Table and the Dunfermline Charity Beer Festival.